More and more businesses are in need of video conferencing software. This is due to an increased global workface and the fact companies now offer more ‘work from home’ options. 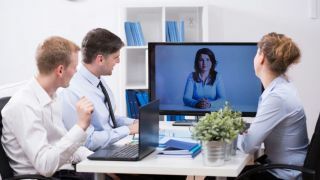 As it is no longer viable to have all your employees sitting around one table, this is where video conferencing comes into its own. Now employees can have personal, face-to-face time with their employees, no matter where they are. In this guide, we will introduce you to some of the best, most dynamic video conferencing tools on the market today. These will range from the most cost effective to those which are more costly but offer some amazing features. Zoom was founded in 2011 and is located in San Jose, California. The company provides remote cloud conferencing. It also offers software which combines online meetings, video conferencing, mobile and chat collaboration. Zoom is used by major companies such as GoDaddy, Slack and Uber. Zoom has four different pricing tiers. The ‘Basic’ plan is free and includes unlimited 1-to-1 meetings, hosts up to 100 participants, 40 minutes limit on group meetings, online support, unlimited number of meetings, collaboration features, security, web and video conferencing features. The ‘Pro’ tier is £11.99 ($15.70) per month per host and has all the basic plan has to offer plus user management, admin feature controls, reporting, custom personal meeting ID, assign schedular, 1GB MP4/M4A cloud recording, Skype for business, REST API and optional add-ons. It is geared for small teams. The ‘Business’ plan is £15.99 ($21) per month per host. It includes all the features of Pro plus extras such as dedicated phone support, admin dashboard, vanity dashboard, on-premise deployment, managed domains, single sign-on, custom emails, LTI integration and Cloud Reporting Transcripts. It requires a minimum of 10 hosts. Finally, but not least, the ‘Enterprise’ package weighs in at £15.99 ($21) per month per host with a minimum of 50 hosts. This includes 1,000 participants, unlimited cloud storage, dedicated customer service success manager, executive business reviews and bundle discounts on Webinars/Zoom Rooms. Zoom’s pricing is competitive as it does not require an annual subscription to avail of discounts. All of its plans are on the lower end of the scale and are paid monthly. It is easy to use and delivers high quality audio and video. Some users have expressed concern over its security measures. However, Zoom is protected by Secure Socket Layer (SSL) encryption along with AES 256 encryption. This will be enough to satisfy the majority of users. BlueJeans was founded in 2009 and has its headquarters in California. The company provides interoperable cloud-based video conferencing platform. There are three pricing tiers. BlueJeans does not have a free tier but it does offer a 30-day free trial. The ‘Me’ tier is $12.49 (£9.45) per month per user. Users can have up to 50 attendees, connect from any computer, iOS or Android device and all meetings include dial-in numbers. The ‘My Team’ plan is $16.65 (£12.60) per month per host and includes all the lower tier had to offer plus 10 hours of cloud meeting recordings, command centre dashboard and up to 75 participants. The ‘My Company’ packages includes all the features of the other plans along with connection H.323//SIP room systems, room system calendar support and up to 150 participants. Users need to contact BlueJeans directly in order to get a quote. Users do not have to sign up to an annual subscription with BlueJeans. The basic tier supports free phone audio in over 40 countries. BlueJeans also supports Dolby voice. This might suit users who are more concerned about video quality rather than the number of features included with the platform. BlueJeans seems to have less features than some of its nearest competitors however this is overlooked due to the quality of their system along with the fact users can utilise the 30-day free trial to see if it suits their needs. Lifesize was founded in 2003. The company’s main branches are located in Austin, Texas and Munich, Germany. Lifesize provides high definition video conferencing endpoints, touchscreen conference room phones and a cloud-based video collaboration platform. Lifesize has three pricing tiers. Unfortunately, there is no free tier, however there is a 14-day free trial. Each tier requires an annual contract which some users may find off-putting. The ‘Mini Bundle’ tier starts at $16 (£12.10) per user per month. This includes 25 users, 1 permanent meeting room, global support, everyday collaboration features and an icon 400 which the company describe as a ‘small conference room solution’. The ‘Small Bundle’ plan works out at $19 (£14.40) per user per month. This includes 125 users, 2 icon 450s, 2 HD phones, 2 wireless sharing devices, 10 permanent meeting rooms, unlimited audio conferencing, single sign-on, Skype for Business interoperability, 50 meeting participants and global support. The ‘Medium Bundle’ package starts at $23 (£17.40) per month per user. It includes 4 icon 450s, 1 icon 600, 5 HD phones, 5 wireless sharing devices, 250 users, 50 permanent meeting rooms, unlimited recording and global support. Lifesize’s prices may seem a bit steep compared to other video conferencing solutions. This is more than made up for with the inclusion of its own hardware into the mix. Users receive numerous devices in each plan, freeing them from not having to rely on their own integrated camera systems. Adobe Connect, formerly Macromedia, was released in 2012. It is software used to create presentations, online training materials, web conferencing, learning modules and user desktop sharing. Adobe Connect is divided up into three separate products based on price. Adobe Connect Meetings starts at $50 (£37.80) per month or $540 (£408.40) for a yearly plan. This includes 25 participants, cloud storage, VoIP, whiteboarding, discussion tools, private sessions and personalized workspaces. Users can customize their own meeting layouts or use included templates to see who is on-screen at any time and how they are being presented. Users can also edit recordings made of each meeting. Connect Webinars starts at $130 (£98.34) per month or $1,250 (£945.50) for a yearly plan. This is most suited for larger events such as town hall meetings. Users can host webinars free for 30 days. This includes a collaborative backstage area for presenters, reporting and analytics tools. Webinars also integrates easily with Salesforce, Eloqua and other CRM software. Adobe Connect Learning is tailored for those in education. It starts at $350 (£265) per month or $3,500 (£2646) for a yearly plan. This includes whiteboarding, polls, discussion tools, high quality video support, reports on participant engagement, unlimited classes for up to 200 participants, cloud storage and VoIP. Adobe Connect is one of the most expensive video conferencing tools available. However, there are several factors which make it worth the expense. The fact that users can edit down videos as well as record them and the ability to create and save custom layouts make Adobe Connect stand out. It also comes from a name which most users are aware and can trust. CyberLink is a Taiwanese multimedia software company. It was founded in 1996. U Meeting is the company’s video conferencing solution. CyberLink U Meeting has four pricing plans. The ‘Basic’ plan is free. It includes up to 25 participants and 50 minutes per meeting. ‘Pro 50’ is $9.99 (£7.55) per host per month. It includes up to 50 participants, 24 hours per meeting, admin tools and PerfectCam. ‘Pro 100’ starts at $19.99 (£15.10) per user per month. This includes all ‘Pro 50’ has to offer plus up to 100 participants. The ‘Enterprise Features’ plan includes all the other tiers offerings plus meeting analysis, premium customer support and end-to-end encryption. Users need to contact sales for a quote. ‘PerfectCam’ is a most random feature. Users can add computer generated makeup to their faces with the company promising to ‘create a truly professional look’. U Meeting is entirely web-based. This might put some users off but it can be an advantage as you will not need to download any additional software to use U Meeting. It also does not offer video recording or the ability to dial into meetings using VoIP systems.